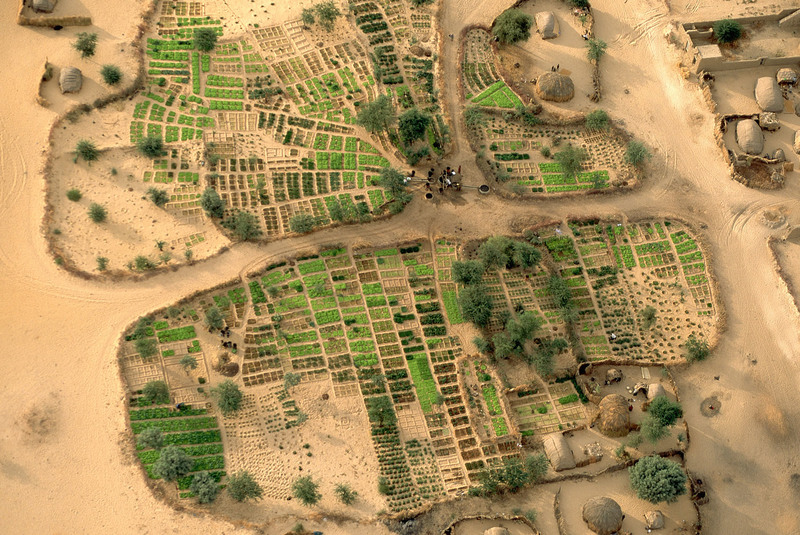 Rectangular fields clustered around a water well, on a bank of the Niger River, near Gao, Mali. © Yann Arthus-Bertrand/Corbis. A big idea in understanding the story of humankind is the formation of communities. To understand why this phenomenon represents a threshold in human development, students need to understand the concept of collective learning and its importance in the creation of societies. They also need to understand how collective learning differs from a nomadic existence built on migration and foraging. Simply memorizing a group of words in a list (nomadic, migration, foraging, and collective, for example) won’t ensure that students understand the key concept: a nomadic existence, one in which people forage for food, migrating from place to place, doesn’t lead to retention of knowledge from generation to generation. Only when people share their collective wisdom to create systems such as written language is knowledge built upon and preserved. The components or medium-sized ideas that go into a big idea are learned as students interact with content through discussion and reading. Making the medium-sized ideas explicit in these discussions—both before and after students read—leads to a more sophisticated understanding of the big ideas. When used to describe human and animal behavior, foraging refers to a way of surviving and adapting to the environment. If students think of foraging as simply hunting, searching, or moving around, they will fail to understand the dynamics of migration and adaptation required for a species to survive and reproduce in a migratory society. The label foraging in the Big History Project course (BHP) is much more than viewing a species as wandering around, looking for food. When students can use the label foraging to capture a network of interrelated ideas, they begin to see why the preservation of information and creation of new information through collective learning represents such a major step in the history of humankind. When they have the right labels for ideas, students can think big ideas and truly participate in the collective learning that moves us forward. Knowing what collective learning represents as a threshold in human development is more than being able to identify or recite a definition. For students to use concepts in their essays and discussions requires that they use words in meaningful ways, not simply repeat memorized definitions. The vocabulary activities in the BHP have been designed to foster a deep understanding of concepts. With this goal in mind, students are involved in reading and analyzing words in a variety of real-use contexts. One vocabulary activity involves students in applying words to excerpts of text that are new to them. Another asks them to pick an idea from several plausible choices. Just as concepts consist of connected words, the critical words of content areas (for example, history, geology, and anthropology) are often members of a network or family of words that are connected by meaning units (morphemes). Examples of such words in BHP include evolution, civilize, represent, transform, industry, and economic. The underlying meaning of industry is still present in words such as industriousness and preindustrial, but the addition of suffixes and prefixes (such as -ness and pre-) can either change the function of a word or adjust its meaning. For adolescents, especially ones who are not avid readers, prefixes and suffixes can make already complex words even more challenging in meaning and pronunciation. But navigating text with important but often abstract and new ideas depends on students being facile and confident in their ability to generalize the meanings of core words to family members with suffixes and prefixes. BHP provides students with opportunities to develop this facility and confidence with real-text applications. An underlying theme of BHP is how the species Homo sapiens developed a precise and versatile symbolic language that enabled us to pass knowledge from generation to generation. The most basic unit of language that communicates ideas is the word. Learning words and the relationships between words underlies the acquisition and integration of knowledge. The ways in which BHP supports students in learning labels for concepts is central to acquiring and generating knowledge.